Russia is adding ships armed with cruise missiles to its Baltic Fleet following NATO's planned buildup on its eastern flank, a Russian media outlet reported on Wednesday. 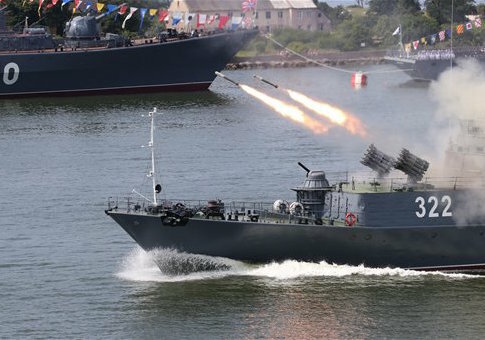 The report from Russia's daily Izvestia, which was cited by Reuters, said that Moscow is adding two small warships armed with long-range cruise missiles to its Baltic Fleet in Kaliningrad, Russia's small sliver of territory bordering Lithuania and Poland. The report, which cited an anonymous military source, comes as NATO defense ministers meet in Brussels to examine the progress of the alliance's plan to send four rotational battalions to the Baltic States and Poland in a build up meant to counter Russian aggression in the region. Tensions between Russia and NATO have run high since Moscow's 2014 annexation of Ukraine's Crimean Peninsula. According to the report, the warships, named Serpukhov and the Zeleny Dol, already sailed into the Baltic Sea and will become part of a new division. They are armed with nuclear-capable Kalibr cruise missiles, which have a range of over 900 miles. The warships are believed to be carrying conventional warheads, according to Reuters, though variations of the missile can support nuclear warheads. Three more warships are expected to join the fleet by 2020, according to Izvestia, and Russia's Baltic coast defenses are expected to add land-based missile systems. The planned four NATO battalions, agreed to by alliance members in Warsaw earlier this year, have been met with criticism from Russia, which has threatened to counter the increased forces by setting up new military divisions. Relations between the United States and Russia have also further deteriorated in recent weeks, largely over the conflict in Syria. The U.S. government also formally accused the Russian government this month of directing hacks into systems used by Americans and U.S. political organizations in an effort to influence the presidential election. Earlier in October, following the accusation, reports surfaced that Russia had deployed nuclear-capable Iskander missiles to Kaliningrad. This entry was posted in National Security and tagged Military, NATO, Russia. Bookmark the permalink.